Are you thinking about adding a sunroom to your home? A sunroom is a great way to take advantage of a spot that receives a lot of sunlight, and serves as a nice balance between outdoor and indoor living. Homeowners with a sunroom often find themselves spending many long summer nights relaxing in their new room that’s not quite indoors but not quite outside either. 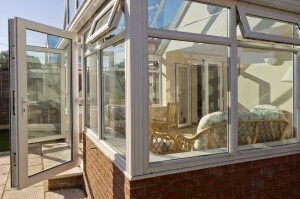 It’s important to consider a few things before you add a sunroom to your home. Learn more about what to ask yourself before you do this home addition, in our blog. What should you consider when adding a sunroom to your home? What will you use the sunroom for? The first thing that comes to mind when most people think about a sunroom is, of course, relaxing and taking in the sun. But there are plenty of other ways to use a sunroom too. You might use it as a breakfast spot in the morning for example. You might also want to use it in the winter, in which case you’ll want to position the sunroom in a location that receives sunlight throughout the year. Knowing what you’re going to use the sunroom will help you decide where to put the sunroom. What’s the ideal place for the sunroom? While we’re talking about location, let’s talk about the ideal spot for a sunroom. It should get at least 4 hours of sunlight every day during all seasons. This usually means positioning the sunroom so it faces south, so it can catch the sun as it moves from east to west across the sky. In addition, you’re going to want to put the sunroom in a location that’s convenient. If you have to go out of your way to get to the sunroom, chances are good that you won’t use it as often as you’d like. What size should the sunroom be? Zoning regulations may place restrictions on the size of the room. Also, you’ll have to consider how much outdoor space you’re willing to give up for the sunroom. If you have lots of space to work with, then this isn’t a big issue. But if you don’t, you’ll have to give it closer consideration. Also, remember that because a sunroom adds square footage to your home, it may increase your property tax. How will I heat/cool the sunroom? The best option would be to extend your HVAC system into the sunroom, but this may not be practical in all cases. IF so, you may want to consider installing an electric fireplace for heating the space in the winter. Installing windows with low E and U values will help reduce heat buildup in the room while still allowing the sun in. This entry was posted on Thursday, June 25th, 2015	at 10:43 pm	. You can follow any responses to this entry through the RSS 2.0	feed. Both comments and pings are currently closed.